Hi, understand it’s not advisable to renovate during 7th month. I would like to check if it’s fine to renovate during Qing Ming? Thanks! 2. In general, Qing Ming is the day/date or period where one should remember one's ancestors and thus pay respects to them. 3. This year the exact date of Qing Ming falls on 5th April 2018. 4. However, it is not feasible for many to take leave on Thursday 5th April 2018 to go visit / pray to loved ones. 5. Thus, for practical reasons some visit their love ones generally around 1 week before or 1 week after 5th April 2018. 6. Look at the above. What has renovations of a home to do with Qing Ming? 6.1 The closest is that one is too busy with renovations to even bother to pay respects! 6.2 Hey! You are not the contractor! You should have some time to pay respects right? 7. Where if one has a habit of visiting an ancestor's grave / niche; do so prior to move-in. 8. If one is also feeling guilty then go visit them on or before renovations (if renovation starts or also falls within this period). 9. Frankly, how to be called a "dishonourable kin" if one does renovations in a new home? How does this anger one's ancestor.. beats logic and reasoning. P.S. Furthermore, if one has never ever go visit .. on Qing Ming.. then all the more one is not affected by this at all. Here, who are you going to anger or cause anxiety to? Case Study: I am confused as to when is the duration of Qing Ming? As I read that some say it is 10 days before and after the actual date of Qing Ming? While others say simply "One week before and one week after" this date? 1. This year Qing Ming falls exactly on a Thursday, 5th April 2018. 2. In other years, Qing Ming may fall on 4th or also 5th April. 3.1. For practical reasons, many are unable to go visit a loved one on a working day like Thursday. 3.2 Either because of work constrains and/or even if one can; other family members may have other commitments. 3.3 For example, if the person can go on that day; perhaps, the children have to go to school and/or wife also faced same problems due to work contraints or need to fetch or look after the young ones. 4. Thus for practical reasons: one best approach or "best practise" is to say that Qing Ming CAN be considered as ONE week before and ONE week after 4th/5th April. Why? 4.1. As mentioned above; this means that some can take the opportunity to visit loved ones a week earlier specially on their off-days such as a Saturday or Sunday. And if unable to do so, can do so the following Saturday or Sunday after 4th/5th April. 4.2. Hope this helps you understand my rationale for saying "One week before Qing Ming and One week after Qing Ming". 5. There are no right or wrong answers. If one wants to play EXTRA safe, you can even say 10 days or 15 days before or after 4th/5th April. 5.1. But please try to avoid insisting on ONE month before and ONE month after Qing Ming! This is extremely conservative. If so, might as well say: This whole year .. cannot move in as it may clash with Qing Ming! if so, go get that person's head examined, please! Hopefully, this is not the thinking of that family's Matriach! If so.. "finished" or lose-lose liao. Please don’t let your house look like another Feng Shui Store! True Feng Shui is not like this! This is Fake Feng Shui! Question: Hi Master Cecil..during Qingming .. can we proceed to open the door? Reply: Yes Qing Ming this year (2019) is on 5th April. If you need to go visit.. then do so before open door. 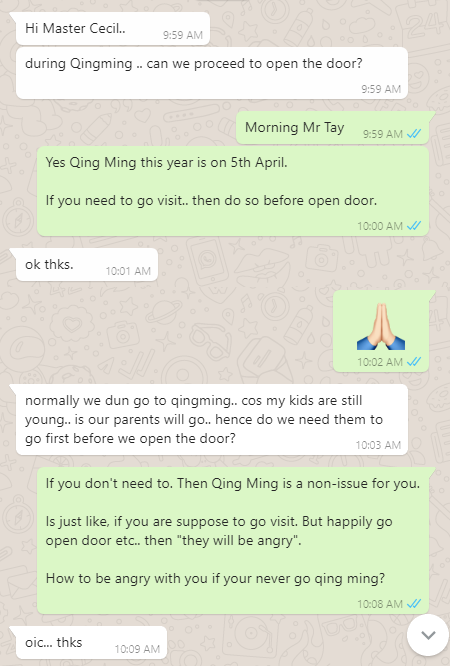 Question: normally we dun go to qingming.. cos my kids are still young.. is our parents will go.. hence do we need them to go first before we open the door? Reply: If you don't need to. Then Qing Ming is a non-issue for you. Is just like, if you are suppose to go visit. But happily go open door etc.. then "they will be angry". How to be angry with you if your never go qing ming?